The delight of that first sip - the alcohol heads off to your hypothalamus, your taste buds go into overdrive, simultaneously your body noticeably and palpably relaxes - that is why we love to have a drink and in particular cocktails. Anyone who has spent much time in my company will have come to know that i am an enthusiast for all things alcoholic. In dealing terms that means that I am a pushover for a cocktail shaker, drinks trolley, jug or ewer and any associated parafernalia. Here I have gathered for fun rather than pure commerce a selection of my 'boozeabilia' together with some recipes and footnotes for my favourite cocktails. If any of the attached takes your fancy please contact me and i would happy to come round and discuss the matter over a glass of something bright and inspiring? After all - the sun is over the yardarm somewhere in the world. A smart drinks table, robust and glamourous, ideal for all your bar needs. An early 20th century brass three tiered etagere, the column supports with multiple rings at the central tier with single ones above and below, the lowest tier having as a stretcher a ring framed by ogee scroll supports. the ceremony of Wine is important. Enjoyment can be enhanced greatly simply by decanting. Obviously wine connoisseurs can wax grandiloquent about the necessity of decanting some wines but even purely aesthetically it is a joy to drink wine poured from a fine ewer or bottle. 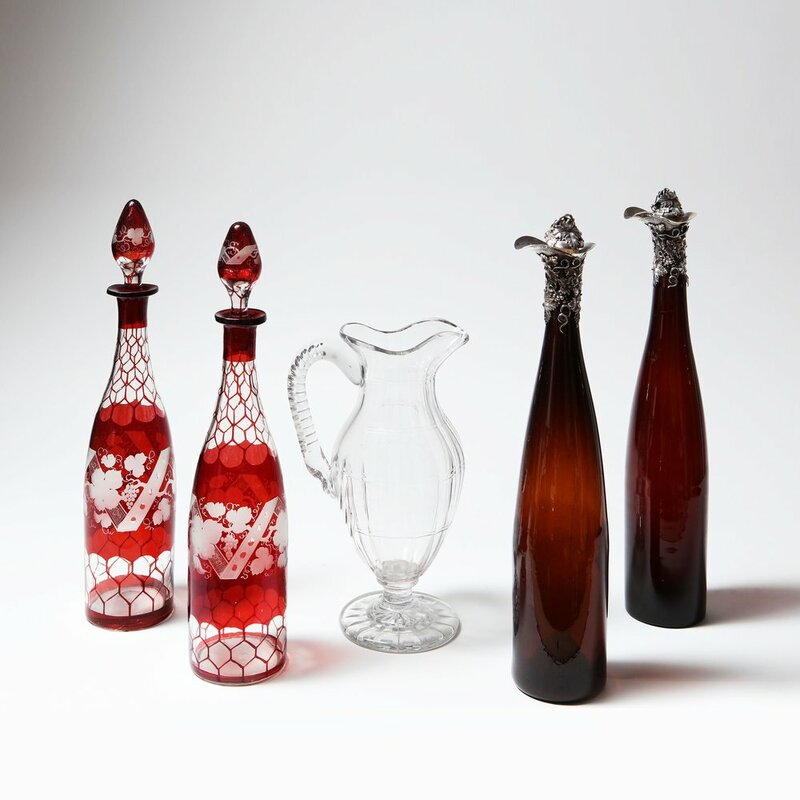 The red decanters are mid to late 19th century. The ewer is a very unusual shape and early 19th century English. and the brown bottles are silver mounted with vines, the silver is dated 1901. These two cocktail shakers are bells and mixing the drinks in the manner of ringing the bell is very effective. The all silver plate one on the left is by Asprey of London and was made and patented in 1937. The other one with an ebonised handle is from the same era and by the Van Bergh silver Co. of Rochester NY. The Martini needs no introduction. It is sometimes my favourite cocktail. For me the best definition of how to make a dry martini was given by the surrealist film maker Luis Bunuel. He said that the best was made by placing the vermouth in the window and the gin on a table thus allowing the sun to pass through the vermouth and engender a flavour without disturbing the gin. He called this the immaculate conception technique, piercing but not breaking. I live in the Oval in London, just five minutes from my door they make Beefeater Gin which has delicate but noticeable citrus notes; this is perfect for my preferred lemon twist variant. The zest when twisted offers up a few drops of its precious oil and this gives the drink a fine surface layer of intense yet oddly almost imperceptible lemon. As vermouth i like Lillet Blanc. It was invented in a small town south of Bordeaux in 1887, it has both citrus and quinine which gives a reviving tonic like quality to drinks it joins. Through clever marketing in the 1920s it became the favourite cocktail mixer for the NY bar trade and thus its place in history was secured. The knife came from the best kitchen shop in the world (my view) Dehillerens in Paris. The glasses I invented as a reversible but super stable cocktail glass. I call them the Diabolo because i like all the implications of that name. A serious glass available on request. The delicious Negroni was reputedly created by Count Camilllo Negroni in Florence at a bar in the via Tornabuoni. It is still there, now called the Caffe Roberto Cavalli but was then known as the caffe Casoni. The count found his drink the 'Americano ' (vermouth and Campari 50/50 ) too weak and asked the bartender to 'stiffen' it with gin. Thus the Negroni was born. The bartender in question Fosco Scarselli added his touch by changing the lemon slice from the Americano for the orange slice that is the mark of a Negroni. In a side note the gin used may not have been the type of gin known as 'london dry gin'; at that time in Italy the sweeter and more aromatic 'old Tom' style was likely to have been used. Therefore respectful of that I have used a strong flavoured and scented one, the cologne made Sunner. The perfect mix is 50% 'Americano' and 50% gin. Campari has been around since 1860, invented by Gaspare Campari. Curiously its distinctive red colour came from crushed cochineal insects until 2006, when chemicals took over from the annual insect carnage. The Rosso predates the perhaps more famous Bianco by nearly 50 years. The use of botanicals in the creation of gin, Campari and Martini Rosso makes the Negroni one of the most profoundly herbal cocktails. Almost a health tonic. It is also one of the few great cocktails that has no connection to NY. Though at a pinch you could reference the Americano. But that was an aspirational name given to a drink that few Americans would ever have heard of and certainly not drunk at the time. PS I don't know why, but I abhor cherries in drinks, there should be one here. pps It is just about acceptable in a whiskey sour. The Manhattan is one of the oldest cocktails, according to legend it was created in NY in 1870 for the mother of Winston Churchill. That story has been clearly proven not to be true but it is the best story and thus should stand. The Black Russian is a post war drink. After the golden age of cocktails but before the modern revival. It was invented in Brussels at the Metropole hotel in honour and for the American ambassador, the legendary partygoer and socialite, Perle Mesta, she was the inspiration for Irving Berlin's 'Call me Madam ' surely due a revival in these days of easily satirised American foreign policy? The Black Russian is best for me as a mix of Stolichnaya Vodka, the classic Russian grain vodka, and Kahlua , a coffee liqueur invented in Mexico in 1936; It has rum and vanilla in it which heats up and sweetens the cold cold vodka. It is slightly tricky to mix because it is also one of those 5ths drinks - 2/5ths Kahlua and 3/5 vodka. So basically a splash under half the kahlua to the vodka. If you over pour it becomes quickly far too sweet. Sometimes I add a twist of lemon to sharpen it up a bit. A modernist circular portable drinks table in the manner of Mathieu Mategot. Having holders below the circular top for 8 glasses and below for 5 bottles. The base is weighted for stability. Mathieu Mategot (1910-2001) was of Hungarian descent starting out his professional life as a set designer. He followed this profession to France where he made his home. He volunteered for the French army during the Second World War and was taken prisoner. He was released in 1944 having learned in prison the metalworking techniques that were to become his trademark. After the war he took French citizenship. His technique is very recognisable; employing tubular steel and perforated sheet metal. Two of his most famous pieces are the Nagasaki chair, 1954, now in the Musee des Arts Decoratifs and the Copacabana chair from a year later now in the Pompidou centre. Both employ this distinctive formula. Below is a large scale blown glass ice bowl of a lovely grey tone and with a large ground pontil mark. Filled with ice and cooling a bottle of fantastic Crement from Sylvain Bouhelier - he thinks he makes Krug and in my view it is jolly good. The bowl is early to mid 19th century. The crement is available from M Bouhelier at the Chatillon sur seine market on Saturday mornings. roasted, oiled and salted almonds. Take the whole almonds in their skins and soak them in boiling water until the skins loosen, remove them and roast the naked almonds in a hot oven for about ten minutes or until they brown gently. out of the oven salt them heavily and leave to cool; don't rush in and gobble them up straight away as they are soggy when hot and only properly crunchy when cool .